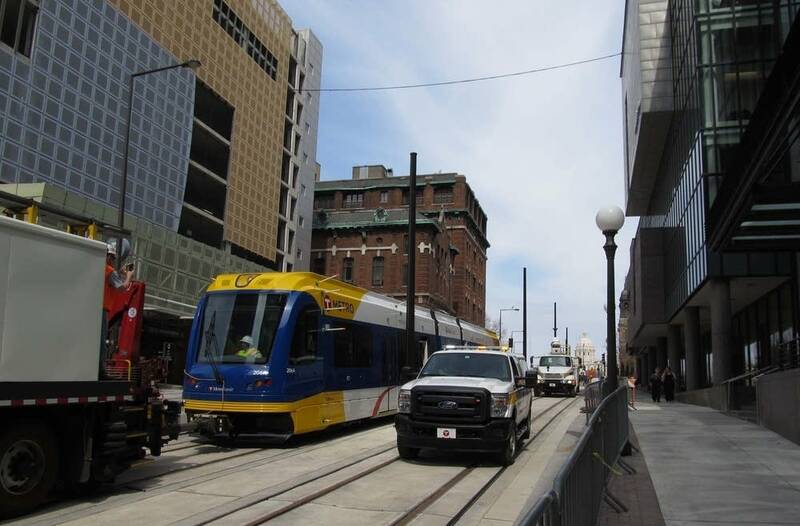 In less than five months, light-rail trains will link the two downtowns of Minneapolis and St. Paul — 60 years after the last streetcar left the Twin Cities. On the platform of the Union Depot in downtown St. Paul, Metropolitan Council Chairwoman Sue Haigh announced Wednesday that Green Line service will begin June 14. That will give the trains about a month to run before the Major League Baseball All-Star Game comes to Target Field in July. The event is expected to draw 160,000 visitors, according to Meet Minneapolis. "I am 1,000 percent positive we are going to open this Green Line on June 14," Haigh said. The $957 million project is on budget. Even though the line has not opened, the project has spurred about 100 development projects totaling a $1.7 billion investment along the corridor that have been built, planned or are under way, according to the Met Council. Light rail planners estimate 40,000 weekday boardings by 2030, helping shuttle people to and from the downtowns, the University of Minnesota, and the neighborhoods in between. Haigh said the line will serve more than just residents commuting to work. "It's also about going to great sporting events, great cultural amenities," Haigh said. "It's going to dinner with a friend, it's going to a doctor's appointment, it's visiting your family. It's really 'destination anywhere.' You can even go to the state Capitol and talk to your legislators. Isn't that cool?" Haigh and Gov. Mark Dayton are pushing for an increase to the metro-wide sales tax to help pay for future transit improvements. But many observers say that is unlikely to happen in a year where every House seat is up for election. The Green Line project is 98 percent complete. Starting next month, trains will run every 10 minutes to test signaling, traction power, and other systems. Work also will continue on a few remaining projects, such as completion of the stairway-elevator tower at Central Station in downtown St. Paul. The Green Line will launch with community celebrations and free rides on all bus and rail routes for opening weekend. Although Wednesday marked a celebratory milestone, the project has been contentious in the past. It was the subject of three lawsuits filed by the University of Minnesota, Minnesota Public Radio, and from businesses and community groups in the Rondo neighborhood in St. Paul. None of those legal challenges prevailed. In front of MPR's studio in downtown St. Paul, engineers have been testing a floating slab track designed to minimize vibrations to the building. Testing showed that the slab was "doing its job" in the warmer months by isolating noise and vibration caused by the train, said Mark Furhmann, who oversees light rail projects for the Met Council. Final results from recent cold-weather testing are pending. MPR remains concerned about vibration and noise "that exceed acceptable levels in multiple broadcast and production studios," MPR said in a statement. The company said the noise and vibration is generated by the vehicular traffic nearby and crossing the floating slab and tracks at West Seventh and Cedar streets.